The Organization for Safety, Asepsis and Prevention (OSAP), a growing community of clinicians, educators, policy makers, consultants and industry representatives who advocate for the Safest Dental Visit™ has announced the release of an updated From Policy to Practice: OSAP’s Guide to the CDC Guidelines. The comprehensive workbook has been updated to reflect the recommendations from the CDC Guidelines for Infection Control in Dental Health-Care Settings-2003 and the 2016 Summary of Infection Prevention Practices in Dental Settings: Basic Expectations for Safe Care. The workbook costs $66 for OSAP members and $78 for non-members and is being released in time for Dental Infection Control Awareness Month (September). 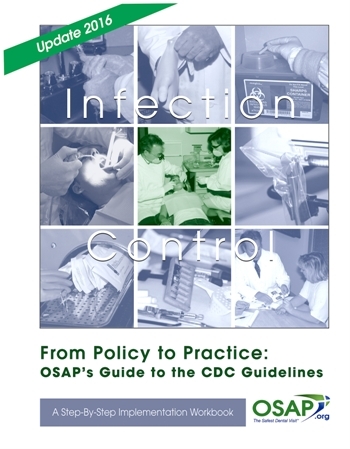 The new From Policy to Practice: OSAP’s Guide to the CDC Guidelines workbook reaffirms the importance of having a comprehensive infection control program including an infection control coordinator and includes CDC resources for developing, managing and evaluating a site-specific infection control program. The workbook walks users through the CDC Guidelines for Infection Control in Dental Health-Care Settings-2003 and the 2016 Summary of Infection Prevention Practices in Dental Settings: Basic Expectations for Safe Care. Each chapter of the workbook contains practical how-to instructions, charts, additional checklists, pictures and captions, and answers to common infection prevention and control questions. The new OSAP workbook contains the reprinted 2016 CDC Summary two-part checklist. By using this CDC checklist, dental practices can evaluate their site-specific written policies and procedures and personnel practices to ensure compliance with CDC recommendations.